There are almost 2,000 asylum seekers now living on the streets of Paris, with the vast majority congregated in a large tent city in the north of the French capital. 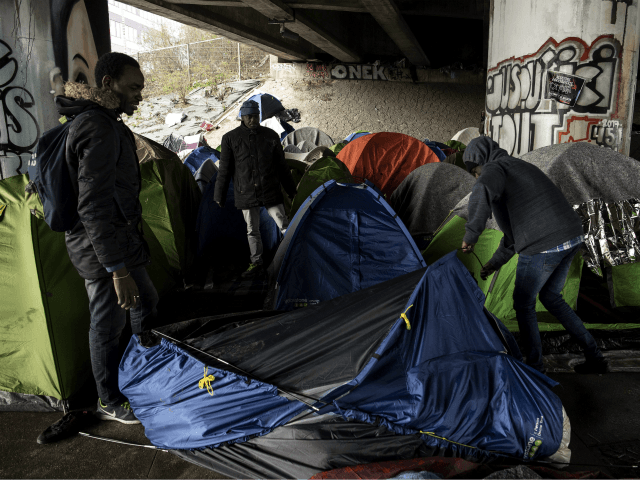 At the Quai du Lot and the Quai de l’Allier an estimated 1,400 asylum seekers live on the streets of Paris, wedged along the border between the city and the heavily-migrant populated suburbs of Seine-Saint-Denis, Le Monde reports. The site lies not far from the former migrant camp hub of Porte de La Chapelle which was largely cleared out by French authorities in May of last year. Breitbart London visited the camp shortly before the evacuation took place during the second round of the French presidential election and asked the asylum seekers about their experiences. One asylum seeker lashed out at Europeans in general, blaming European countries for the situation in his native Nigeria and demanding a job and a place to live. The Canal Saint-Martin also houses another makeshift tent camp of around 400 Afghan nationals. A total of 920 tents housing around 1,885 people were recently counted by the asylum organisation France Terre d’Asile. The migrant camps have affected the city in a number of ways, including leading to the closure of the art museum Art Ludique which featured “pop art” including cartoon and comic book works. The presence of migrants near the museum led to a rapid drop in visitors and a subsequent decline in revenue needed to keep the museum open. Roving gangs of underage Moroccan migrants have also become a major problem in the north of Paris, leading to 1,600 local residents signing a petition demanding the government deal with the problem. Both residents and local business owners complained of targetted attacks and thefts from the migrant children. The homeless migrants are still a small fraction of the total number of asylum seekers in France, with the country seeing a record 100,000 asylum applications in 2017.